Fukiya Nakamachi Street (吹屋中町通) is the best 8 walking spots in Japan. There are many traditional houses with Bengara arts in this street. The entire area is designated as the national historical and cultural preserved district because of those traditional Edo style houses. Fukiya is located on the mountain of middle north western Okayama Prefecture. The altitude of the village is 550m from the sea level. Fukiya greatly developed with mining and Bengara during Edo period. It was the largest mining in Chugoku region. Bengara is red material which used widely for painting and coloring in Edo Period. It was produced from oxidized iron. Bengara was very expensive. Therefore, the producers of Bengara and Fukiya village itself made a great fortune. 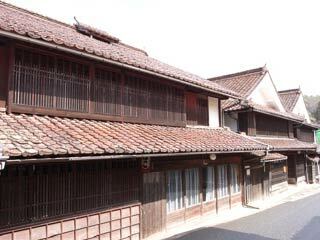 In the main street of Fukiya remain many traditional houses which built in Edo period. Those houses took finest art and materials in Edo Period. These houses are also painted with Bengara. Bengara blinds, roofs and walls.